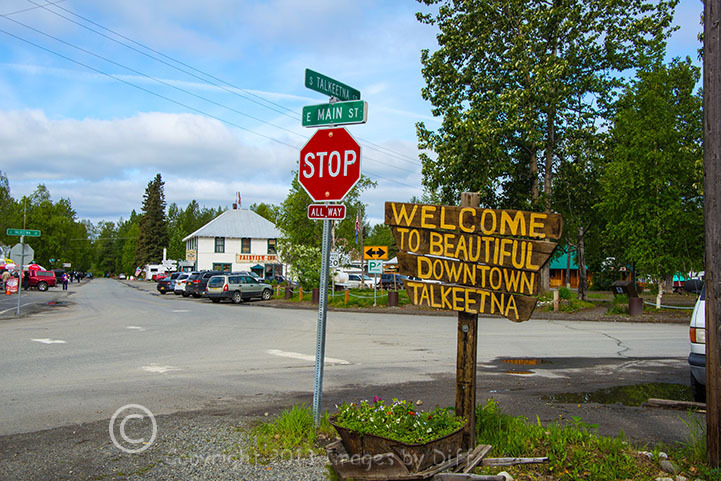 click photo to enlarge Talkeetna is a funky little town with a small downtown area full of shops and restaurants. We found it very interesting. 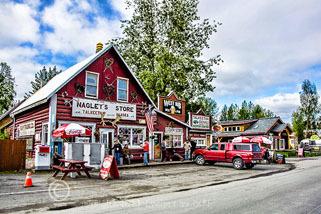 It is the hub for all people going to hike Mt. 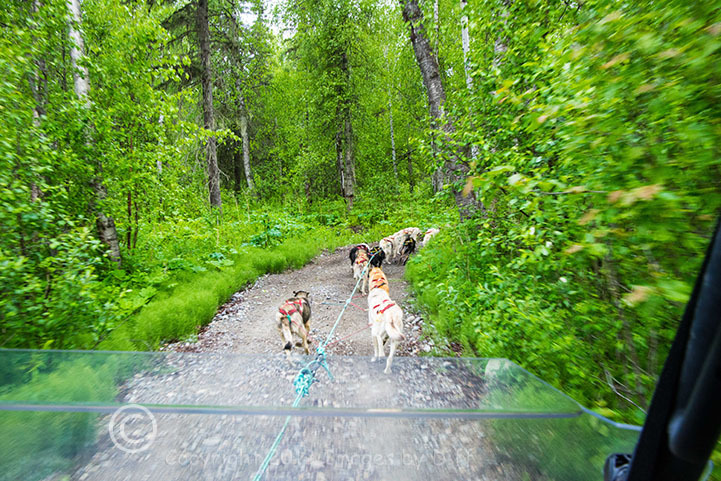 McKinley, fly to the glaciers, go white water rafting or train dogs for the Iditarod race. 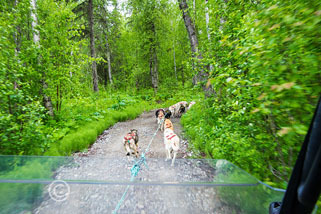 We were in town to go visit Sun Dog Kennels, which is a training place for the Iditarod. 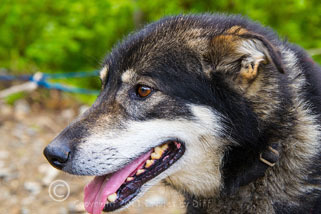 click photo to enlarge The sled dogs are raised and bred to run and pull, and they really get excited about the chance to do it. They know when a stranger comes into the kennel area they may get the chance to pull a sled. Then they all start barking and jumping like crazy, as if to say pick me coach, pick me I want to pull. There were about 75 dogs and only 12 were chosen to pull the rig. They know when the harness is full, meaning nobody else will get picked, and then they stop barking. We were the only people on this morning tour and Sun Dog Kennels did a great job. 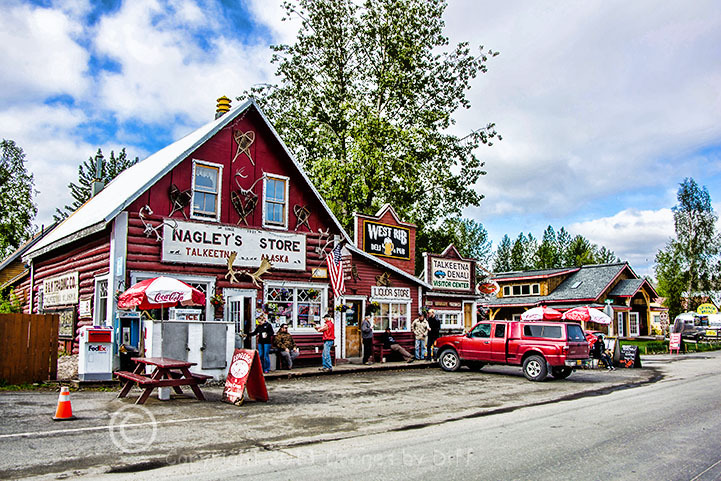 click photo to enlarge We ate lunch at the Roadhouse in downtown Talkeetna. At the Roadhouse, you sit at communal tables. The young man sitting at the table with us had just come back from trying to hike Mt. McKinley. I say try because he had been unsuccessful as the weather never cleared for him to make the final assault on the summit. He had been up on the mountain for 2 weeks. You hike up to a certain elevation, about 16,000 feet and stay for a week or more in order to get your body acclimated to the elevation before making the final ascent to the summit. You also have to wait for a clearing in the weather. The mountains shown in the lower left picture were taken from the deck at our hotel. 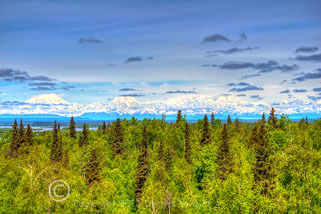 They are the Alaska range and Mt. McKinley is in the photo.